Kohlrabi (German neep or neep cabbitch) (Brassica oleracea Gongylodes group) (Olkopi in Assamese an Bengali) (Monji Haak in Kashmiri) is an annual vegetable, an is a law, fodgle cultivar o cabbitch. 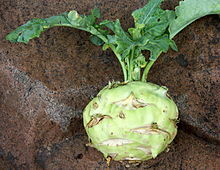 Kohlrabi can be etten raw as weel as cuikit. This page wis last eeditit on 14 Februar 2018, at 18:36.